I just release my first beta version of the Designer plugin. With this plugin, you will be able to spawn, rotate, and scale an actor in a single click! 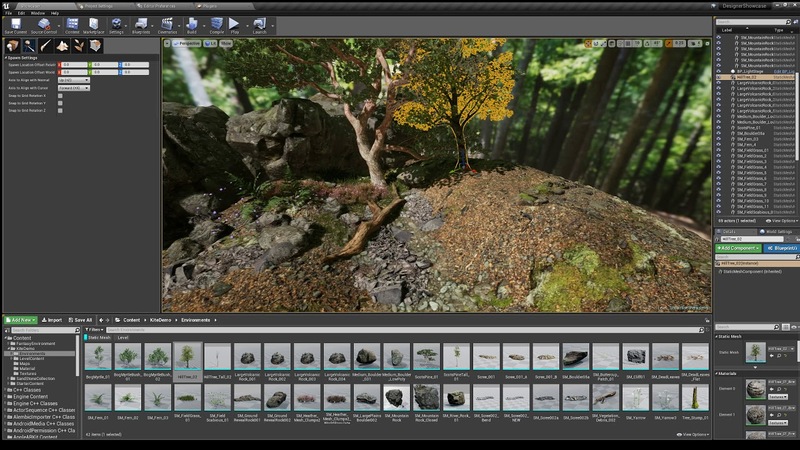 Download the latest version of the Designer Editor Mode plugin for Unreal Engine 4. Last edited by Roel; 01-23-2018, 04:12 PM. Interesting I'll give it a go when I've got some time. I like things that speed up repeated tasks. Many thanks. I'm thinking about a solution for this which fits this tool, I will put it near the top of my list. I'm first gonna get some small things, after which I will look into a proper solution for this. hey. nice tool. I have downloaded it and i can see it in my editors, but when i drag an object with ctrl+left mouse button in the scene nothing will happen. i tried different settings in the designer tab, but still objects spawn in the normal way. any suggestion? Hi Hosein, You need to select a placeable asset in the content browser (static mesh, blueprint etc...) and make sure the designer editor mode is selected in the modes window. Use ctrl + hold left mouse button down + drag in a direction to spawn + rotate + scale. Please check the manual for more info: https://www.unrealengineer.com/designer-manual. No plans for supporting older versions of the engine at this point. What is your reason for not updating to 4.18? I'm using NVIDIA's custom UE4 build: VXGI, HBAO+ edition. This is still not updated to the 4.18 branch, so need to use 4.17.x. The plugin is still under heavy development which is why I do not want to focus on supporting all engine versions. While it is in beta I will make it work with the latest stable release available in the launcher. The NVIDIA branch will probably be updated. In case you want to try it now you could get the plugin from GitHub, fork it and compile it with your custom engine. Make the required changes if it complains about anything. There shouldn't be too many differences. Let me know how it goes! I have compiled it succesfully with some changes in the code (about 5 minutes work). But trying enabling the plugin UE displayed error message and couldn't load the plugin. So I gave up, because I didn't find what is the problem. I have chacked NVIDIA's branch and VXGI for 4.18.2 is available 3 days ago, so now I'm upgrading my project to 4.18.2 VXGI branch and will try your plugin. Your compiled plugin is not working with it, so need to build it. The Designer plugin working fine with this branch. Awesome idea, I'll run this past our level design folk, see what they think of it. Heyyy, I just tried the tool, and it's really cool and super fast for populating a scene with random props. But it's seems like the tool does not work when placing object on BSP Geometry.